Christmas Walk in the Peak District starting at 10.00 am at the Roaches (between Hen Cloud and the Roaches at SK 003 621) for a 3 hour stroll to the Ship Inn at Wincle for lunch, before returning by a shorter route. Full details of the planned route are here. A report on the actual walk can be found here. Sat 17 to Sat 24 November Jordan - Spice Trails of Petra with Explore. See blog for a full report. Mon 5 to Mon 12 November Madeira - a week of levada walking from an apartment in Canico. See blog for a full report. Thursday 18 October Old Glossop - met 7.00 pm at the Bulls Head, Old Glossop (SK 042 947), for a 5 km stroll and a meal afterwards. 6th and quickest trip on this 26 mile mountain bike route around Calderdale in 3hrs 15 mins. Sunday 30 September Blencathra - started at 10.30 from Threlkeld (NY 325 254) for a walk via Hall's Fell. A good day out. Monday 24 September Peak District bike ride, 30 miles in the rain, starting from Roman Lakes, Marple, at 10.30 am and passing through Lyme Park and Taxal before abandoning the attempt to get to Buxton and returning from Errwood Reservoir, mainly beside the Peak Forest Canal. 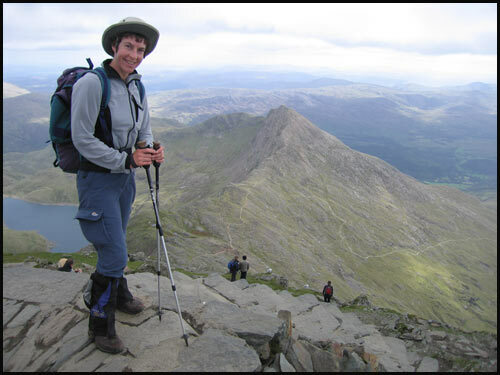 Friday 14 September A stroll up Snowdon via the Watkin Path and Yr Aran. Sunday 9 September Peak District Bimble, a select group of 6 started from Hartington at 11.00 am. (SJ 775 769), on a warm evening with a lovely sunset. 25 August to 2 September 'Carry On Up The Vanoise', featuring The Cag Angel, Memory Man, Birthday Boy, Night Bird and Notchy. Report - watch this space...Photos - a Photobox slide show is available on request. Report here. Sunday 12 August A day out in Northumberland, starting at 10 am from Old Berwick - NU 066 215. Sat 21 to Sat 28 July Alpine Hut to Hutting - Zillertal Hut Tour - click here for more details of this trip. Report here. Sat 14 to Sunday 22 July Dolomites - Fixed Camp in Cortina - see here to get an idea of what was available. Thursday 28 June A glass of champagne was enjoyed at The Wood House, Lower Withington (SJ 807 701) from 7.00 pm before a dampish but sociable wander around the parish of Lower Withington. Saturday 2 to Friday 8 June B&B Backpack in the Lakes - reasonably gentle days in fantastic scenery in good company with not a drop of rain! Route. Comparisons with previous trips. Friday 11 to Thurs 24 May Backpack across Scotland - TGO Challenge - see Martin's report here. Saturday 14 April The Calderdale Hike - a 27.5 mile walk taking in the best of Calderdale. Martin and Rob enjoyed this in a leisurely 8.3 hours on a hot, dry day. Here's a report on this most enjoyable trip. Wednesday 21 March Ancient Cheshire - met at the George and Dragon in Great Budworth at 7.30 pm for a 6 mile circuit of Budworth Mere, with a stretch along the Trent and Mersey Canal passing the Anderton Boat Lift. Map. Wednesday 28 February Another canal and railway walk. Two of us started at the well appointed Miner's Arms, Wood Lane North, near Adlington, at 7.40 pm for a 2 hour 10 min stroll down the Macclesfield Canal to Bollington, and back up the Middlewood Way - about 6 miles in total. To get there turn off the A523 north of Adlington to Skellorn Green, then left and right to Wood Lanes, and the Miner's Arms (SJ 938 820) is up a lane on the left. Map. We had a good walk after a soaking wet day, with the moon beaming out from behind dark clouds every now and then, startling us as we imagined brightly lit ghost trains bearing down on us! A 5 mile walk around Lymm. Started at 7.30 pm from the car park outside the church hall (behind Lymm Church - SJ 684 867) and enjoyed dry weather on canal towpaths and disused railway lines. Sunday 7 January A Bimble in the Peak District with Sue Williams - about 11 miles, started at 10.00 am from the Tissington Trail Car Park in Tissington at SK 177 520, going up the trail to Milldale, down Dovedale, and returning back up the old railway line. An excellent day out. Fair weather option: meet at Old Dungeon Ghyll Hotel (NY 286 061) at 10 am for a stroll over Crinkle Crags and Bowfell.....Yes it was fair - we had a lovely walk on which we met just 6 people!